That’s right. Emerald is the Queen of Jewel Tones. It always feels so regal whether it’s being dressed up or dressed down. 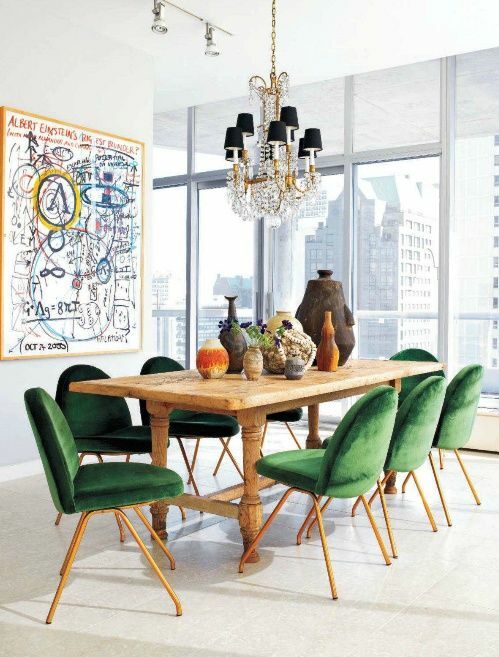 Above, the rich, velvet drapes in emerald green transform the space and exude sophistication. 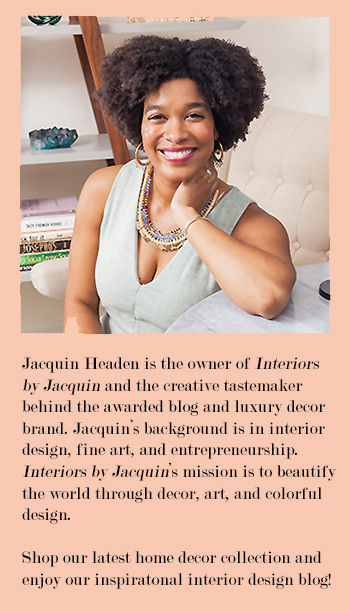 I especially enjoy the beaded chandelier as a natural element that juxtaposes the velvet – very smart indeed. The emerald wall above is such an unexpected punch! Although it’s such a tiny corner, the green isn’t overwhelming at all, which I attribute to the impactful gallery wall. This space is perfectly curated and intriguing to the eye. The bold emerald wall gives the space a true depth. The global living room below is also an example of masterful curating. While this room only uses emerald green as an accent, the emerald glass bulbs anchor the room and add to its visual interest. The dresser above is an upcycled piece that really illustrates just how effective a can of emerald green paint can be – quite literally, transformative. This old dresser, which was originally a plain medium wood tone, now looks like a regal work of art. The gold hardware adds to the luxe look and the peacock design really gives it a custom stamp. Why not try your hand at making your own fabulous, emerald accent piece? 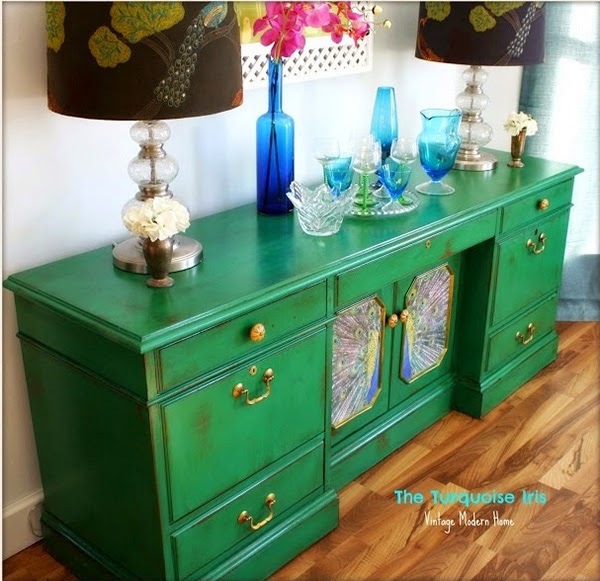 This beautiful furniture was painted and upcylced by Dionne of The Turquoise Iris. She refurbishes and reimagines fantastic furniture for her Etsy shop. Check out her before and after photos here. Maybe you’ll be inspired! Emerald and gold are a classic color combination. It’s so sophisticated, even when done casually like in the dining room above. In fact, one of my favorite pair of earrings has this color combination, making it my go-to for a chic outfit. 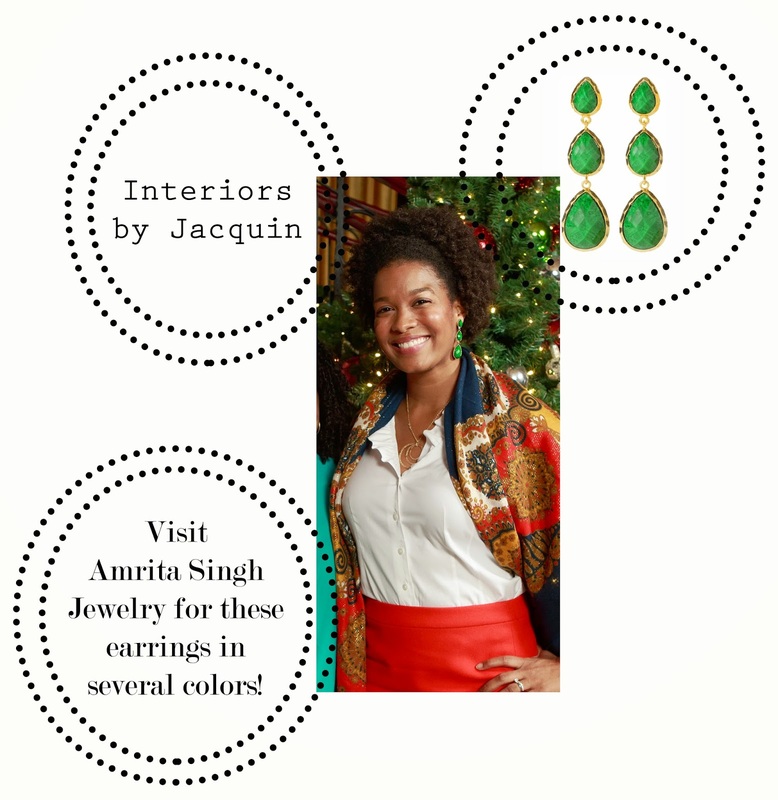 I thought I’d leave you with a shot of my fab earrings just to show that emerald is not only the Queen of jewel tones for interiors, but for stylish accessories too.